Photographing shawls you’re still knitting is very frustrating. A million stitches, bunched up into a little ball, doesn’t look like anything special. And, sadly, my Mara shawl is destined to look quite unspecial for a while longer. With only 2.5 rows remaining I ran out of yarn! 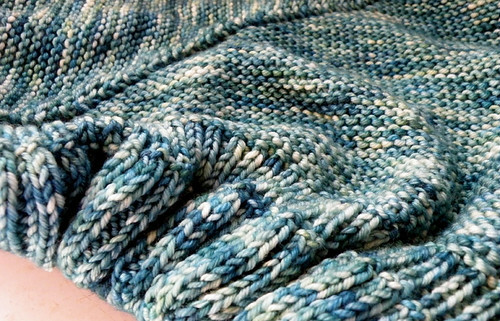 Yes, I could just tink back a couple rows and bind off a little sooner, but there are close to 500 stitches on my needles and the idea of pulling out that many stitches makes me feel a little wobbly. The yarn I’m using is Wool Candy Fondant, another one of my Sock Summit purchases, and luckily Adrienne, the dyer, is going to dye me up another skein. The next project I’m working on I’m really excited about – it’s my own design! But this is all that I can show you. I haven’t decided yet whether or not I’m going to self-publish it or submit it somewhere for publication. 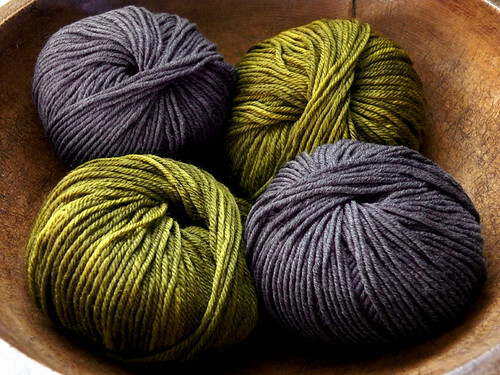 Worsted weight wool in steel grey and olive green – the possibilities are endless. Those are all fantastic colors. Can’t wait to see them in action! I love your color combination. Good luck! Interesting color combination – I like it! Hi there–just found your blog. I love your projects, and I love the High Street vest! And can I say that you are very beautiful (without sounding too strange)?